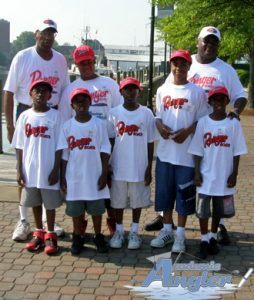 Hampton, Va. – On Saturday June 7th, forty boys and girls fished with the Academic Anglers Professional Fishing Team aboard the Ocean Eagle Fishing vessel. On this day, every child had the pleasure of catching fish. Their activities were captured in a wonderful slideshow. On this beautiful but hot and humid day, Academic Angler Professionals, William Mobley Charlie Roberts, Carter Tillage, and LaRoy Taylor conducted seminars on knot tying, casting , and marine safety to a group of enthusiastic future anglers. The children were very attentive and anxious to learn fishing tactics and techniques. After lunch, which was provided by Harry Bonner, the children boarded the Ocean Eagle and cruised to the fishing grounds. Once they arrived at the fishing grounds, it didn’t take long before the kids started landing fish. The boat was abuzz with joy and laughter. After a half day of fishing in which all the children caught fish, the boat returned to the dock for the awards ceremony. At the awards ceremony, each child was presented with a certificate, a Shakespeare rod and reel and a meal of hot dogs and hamburgers. The Academic Anglers want to thank our sponsors, Ranger Boats, Shakespeare Fishing Tackle, Harry Bonner, Norfolk Elks Lodge #38, Pepsi-Cola Bottling Newport News and our many individual supporter for making this event possible.